The sky was gray and the wind swept with a light bite from the northwest. Ocean Beach Pier is a fantastic concrete structure shaped like a “T” (see the photo.) This was my first time to this pier and I wasn’t sure quite what to expect. Thunder is what I got. Instead of my usual rubber lures and frozen anchovies, I decided to try a new trick I learned from an old angler: Salted anchovies! Yeah, it sounds like a big “so-what” but the salted anchovies add two benefits. First, they stick to the hook a LOT better. Usually frozen anchovies falls right off the hook. The other benefit is that the salt hides a lot of the “human scent” you leave when handling other bait. Some fish are sensitive enough to release the bait before the hook catches if they sense it’s foreign. The results speak for themselves. 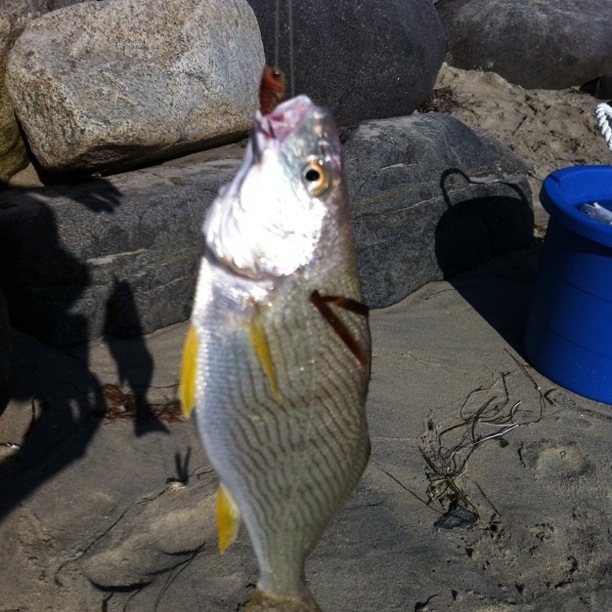 After 20 minutes I landed a 15″ sand bass that put up such a big fight he decimated my reel. Good thing I brought two poles. The current was fair and came straight from the west. Ocean Beach has a nice little cove the pier sits in and the species of fish was amazing. I saw a five or six foot shark chase a mackerel someone caught up to the surface before it retreated below. Another angler said he saw two yellow fin swimming about. Marlin showed me a picture of a black sea bass he caught the night before. The thing was at least two feet long! He had to throw it back since the black sea bass is not a permitted fish to keep in California. I’m looking forward to coming back to this pier. Let’s see if lightning strikes twice. Maybe I’ll give salted fish bait another chance on some other piers. Sabiki lures are great for pier and boat fishing because they’re so irresistible to smaller bait fish. 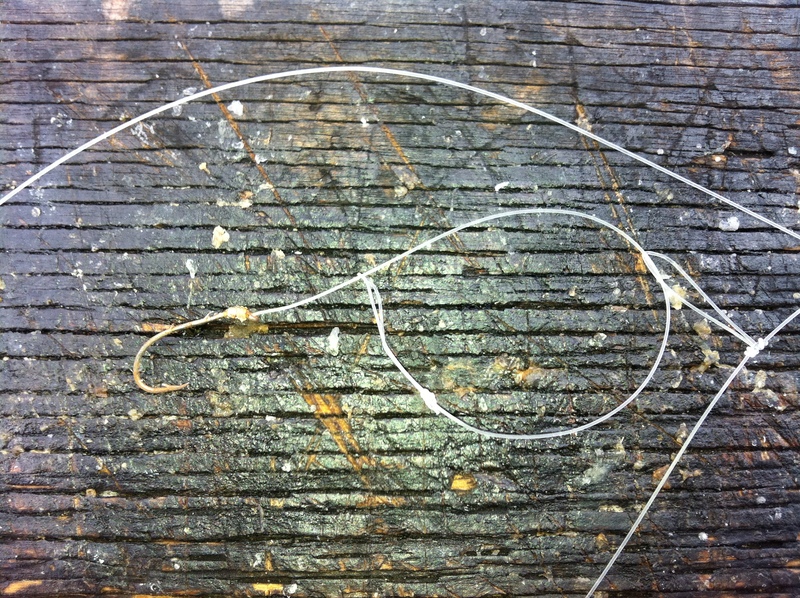 A sabiki lure consists of a 3-4 foot monofilament line with 4-10 pre-attached small hooks made to look like tiny shrimp. Drop a sabiki in the water off a pier or boat, maybe 10 feet deep or so and bob it up and down in the water and wait for the little ones to bite. I’ve seen anglers bring in three and four fish at a time with this clever lure. The problem with the sabiki is that it’s a pain to store. The little hooks get all tangled up in everything and many people just throw them away after a day of fishing. If you have the money and the space, you can use a sabiki rod to store a lure but why? 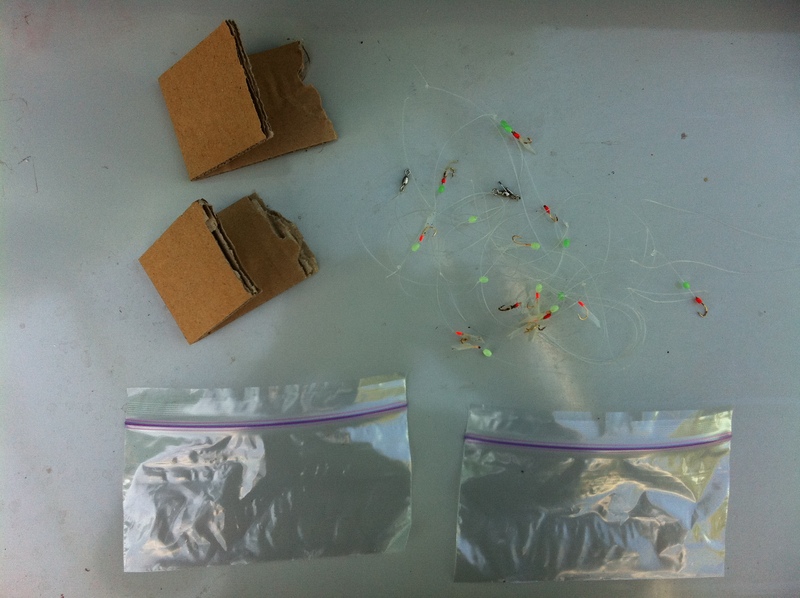 Here’s a little trick I learned from a humble angler in Oceanside and it’s great (and inexpensive) way to store sabiki lures without the mess. 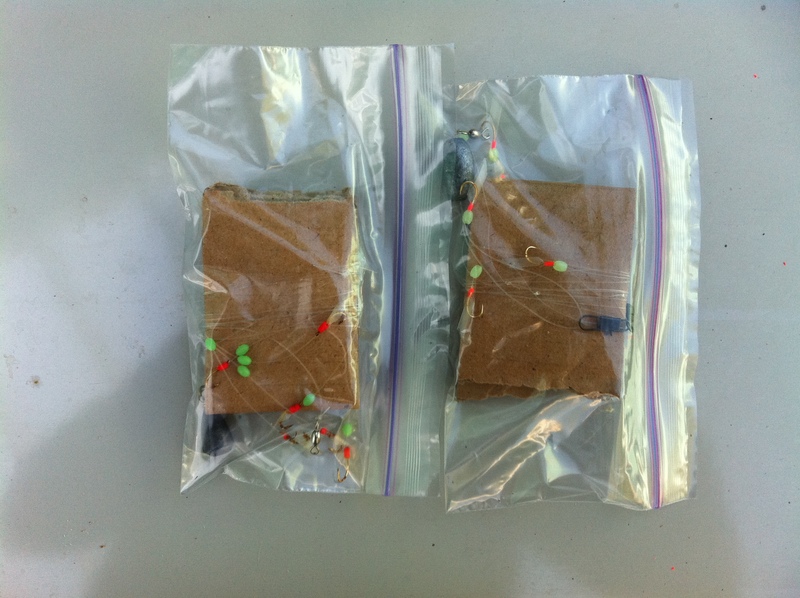 Wrap the sabiki around the cardboard and put the whole thing in the zip-lock bag. Done! Now you can store it in your tackle box tangle-free. Surf leaders effectively double your chances of catching a fish because you have two hooks in the water instead of one. It’s also a great way to try different baits at the same time to see which ones are working best in your fishing area. Here’s a picture of the surf leader with two loops. The metal clasps are not shown. Then you thread the hook through the leader loop and then around itself. Adding weights are even easier. Just attach the weight to the clasp. In Southern California the currents can be strong so I prefer 4 oz pyramid sinkers on the shore so when you cast out the weight buries itself in the sandy bottom. On piers I generally use 2oz or 4 oz sinkers. Of course, sea weed is your biggest threat and I’ve caught plenty of kelp monsters using a surf leader setup. It comes with the territory. This rigging works best for bottom feeders and near-bottom feeders like rays, some sharks, croaker, bass and surf perch. I’d like to catch a halibut using this rigging, but halibut like live bait, and live fish bait such as anchovies or smelt are not recommended for this rig since they tend to swim around and tangle everything up. Surf leaders are great for baits like squid, shrimp, mussels or worms. Gulp! artificial blood worms are like magnets to croaker and perch. See how I’ve looped the snelled hook through the loop and then itself? Pull it tight and it will hold strong. 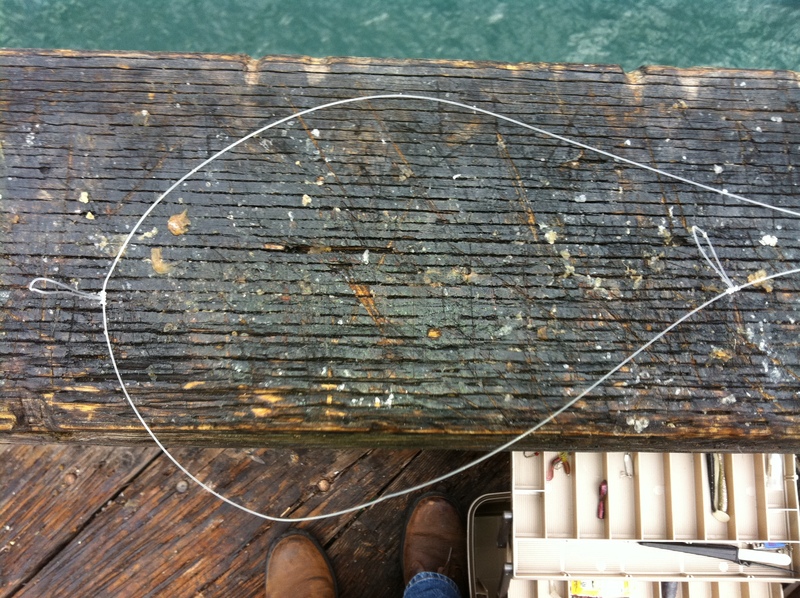 By looping the hook on this way, you can also remove it later and reuse your snelled hooks. Handy dandy. Now get out there and catch dat fish! 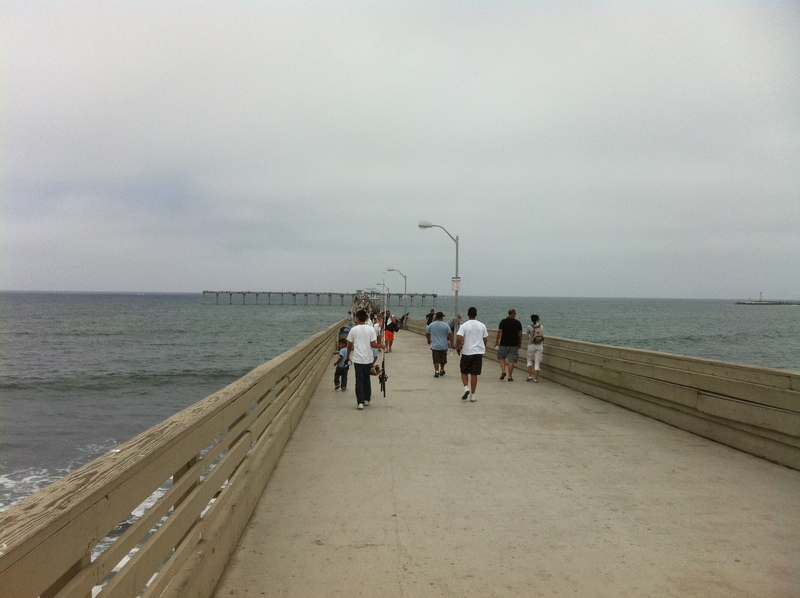 I fished Oceanside Pier today. Pier fishing requires a little bit more gear than shore fishing but mostly for comfort. While shore fishing is more of a solitary pursuit (its hard to hear anyone talking over the crashing waves), pier fishing is more social. It’s a great way to meet more experienced fisherpersons and learn some trick of the trade. I didn’t catch a dang thing, not even a nibble. Wind was coming from the north and it was cloudy gray ick. I would have thought this kind of weather was classic for fishing, but no one was really catching much. Beautiful day though, even if a bit cold. This picture was taken facing northwest. That’s a Ruby’s Diner at the end of the pier which is a cool place to come for a burger. Made a new friend. 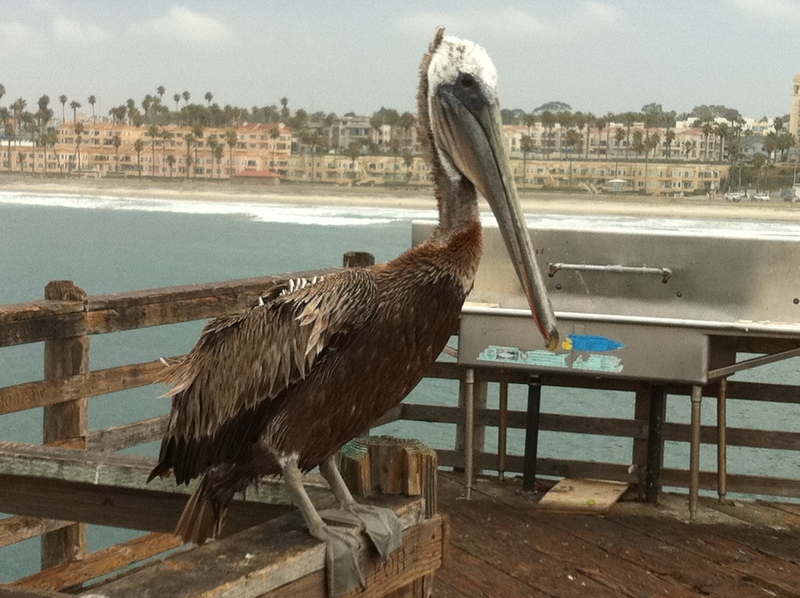 The California Brown Pelican has been making a come-back in San Diego. The smart guy in these pictures has learned if he hangs out by the fish cleaning sink that generous fisherpersons will throw him a snac k now and then. Feeding wildlife on piers like this is not permitted. 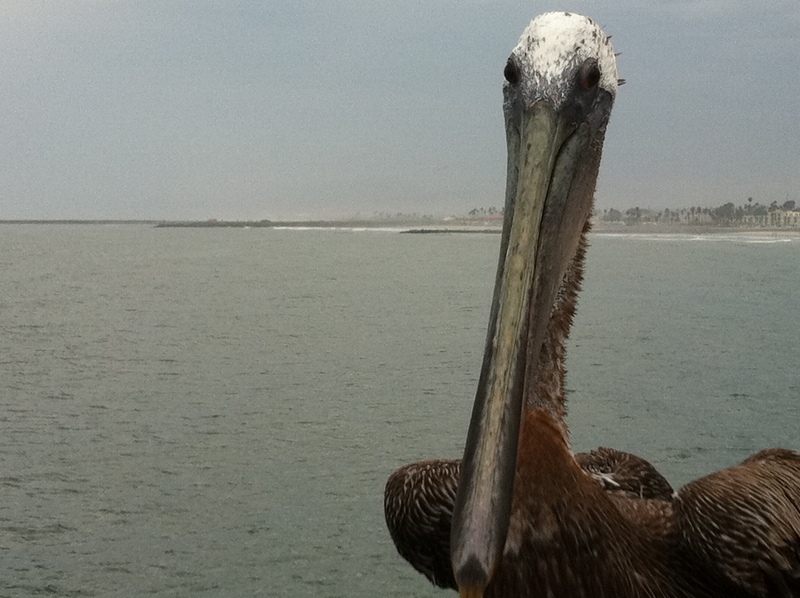 We don’t want pelicans becoming dependent on humans, or worse, stealing our bait! If you do feel the need to feed, never give them frozen bait. Only fresh fish. But it’s really better not to feed them at all. Just take pictures like me! Don’t get any ideas, wise guy. You’ll get no food from me. Now stand there and pose like a rock star. 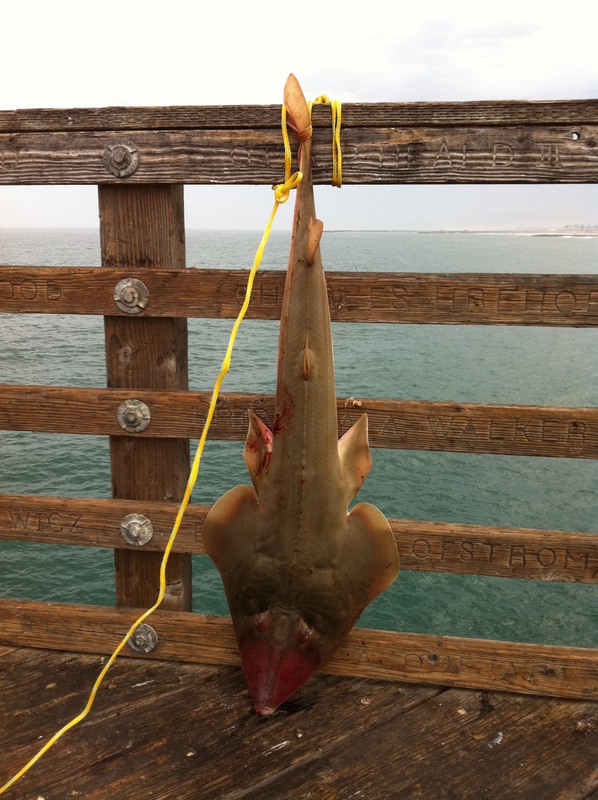 Another fisherman caught this guitar fish (a.k.a shovelnose shark.) Says he grills them. It’s all he fishes for here. This fish’s bait of choice is squid. 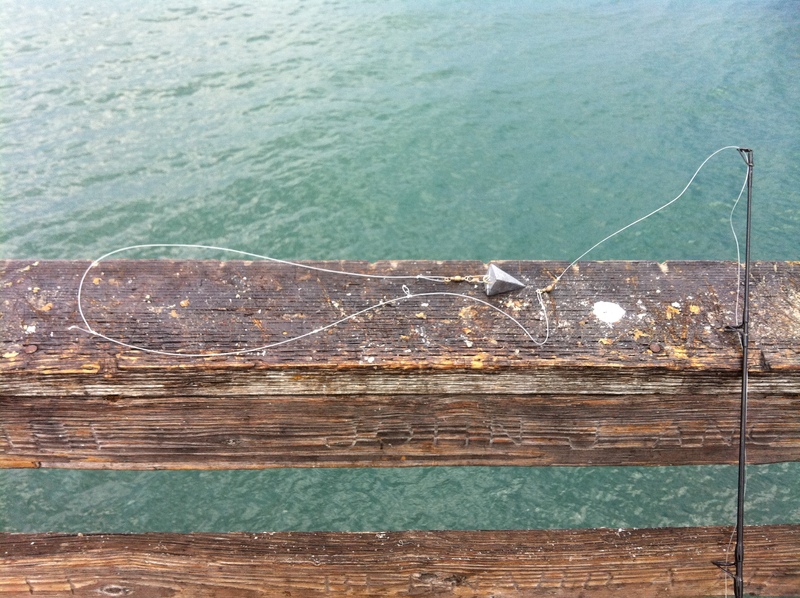 I try to avoid them because they weight a lot and you need a net or a gaff hook to bring them up (another reason pier fishing requires more gear…its hard to reel in a 20 pound fish 50 feet in the air on 12 pound test line. I really need to invest in a net because the gaff hook is a terrible way to bring up a fish if you plan to throw it back. Speaking of more gear, don’t forget to bring a folding chair or a stool. Not many benches and you probably wouldn’t want to sit on them anyway. And a blanket or good jacket. Unless the sun is shining, its bound to get chilly! So after a few hours of catching nothing but nothing I bailed with some great pictures. The Ninth Annual La Jolla Kayak Fishing – Steve Moyer Memorial Kayak Fishing Tournament is September 11th 2011. Proceeds go to cancer research. Catch dat fish! Give someone hope. This photo is linked from the official website. Shore fishing in Oceanside this weekend. Reeled in some great fish. The yellow-fin croaker in one picture is over a foot long and about 2.5 lbs. I kept dat fish! 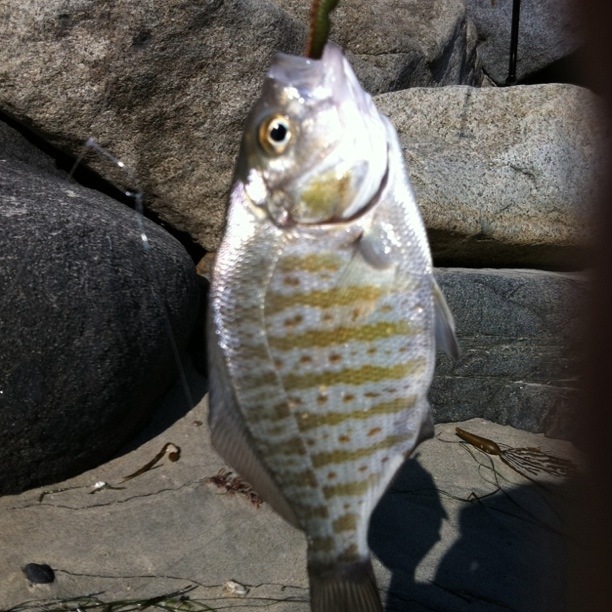 The other two are surf perch, too small for anything but pan-frying. I let them go so they can grow up to tell their children crazy stories about how they actually lived out of the water for a time after munching on a strange worm that gave them bad dreams and a mouth-ache. The weather was a bit humid, but absolutely nothing to complain about. Temperature in the high 70s. Water temperature must have been very high 60s or low 70s. Perfect wading weather. The current was a bit strong and northward. Even with a four-ounce weight I had to reel in & cast out every 15-20 minutes before my line ended up back on the shore. Seaweed and kelp were everywhere! Lots of blooming going on. 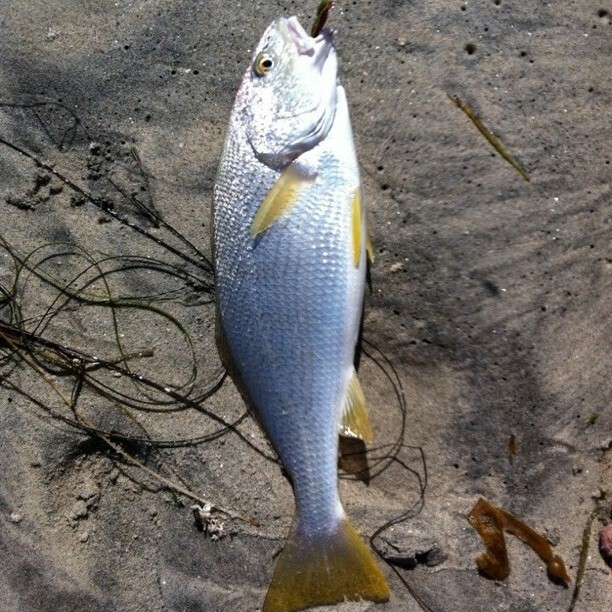 Below is one beautiful yellow-fin croaker. Into the bucket with you, mate! This surf perch will think twice about eating strange food! And his brother wasn’t much smarter! Beautiful fish though. Surf perch are easy throw-backs because they have soft cartilage mouths that make the hook easy to remove without causing excessive damage. Notice the kelp-colored stripes along its side. Makes it easy to hide out there in the underwater wilderness. I’ve lived in Southern California all my life. There’s no better way to spend a warm day than knee high in cool sea water along the Southern California shoreline with a fishing pole in hand as the sun drifts towards the western horizon. I’m no expert at fishing, and for several years I had forgotten all about it. A couple of days on the Catalina Islands re-ignited my passion for fishing when I hooked a couple big mackerel one night. There’s no way to describe the fight those fish put up when they know their life is–literally–on the line. It’s a primal feeling that is difficult to describe unless you’ve felt it first hand. When Hurricane Katrina hit I realized it might be a good idea to hone that skill. Fishing is not just a sport. It’s a means of survival. Fishing is a science and an art. Fishing is poetry. Beginning with this post, I want to talk a little about what makes fishing so great, why Southern California is the place to do it, and maybe share some ideas on how to get the most of your own fishing experience. If you enjoy fishing, whether it’s on a lake, river, pier, boat or the shore, then I hope you’ll come along.